The family have paid a travel agent around 50,000 yuan (S$10,200) for the stay in Chiang Mai in the mountainous north of the country, including transport, a three-week summer camp for their daughters at a local international school, rent for a serviced apartment and daily expenses. Zhangle loves Chiang Mai's relaxed lifestyle and easy atmosphere and wants to live as a local for a month or even longer, instead of having to rush through a short-term holiday. "It would not be just [tourist] travelling but rather a life away from the mainland." she said. "I think this is becoming a trend. Chinese middle-class families are facing increasing difficulties to emigrate and own homes overseas. On the other hand, they still yearn for more freedom, for a better quality of life than what is found in first-tier cities in China. They are eager to seek alternatives to give themselves and their children a global lifestyle," said Cai Mingdong, founder of Zhejiang Newway, an online tour and education operator in Ningbo, south of Shanghai. 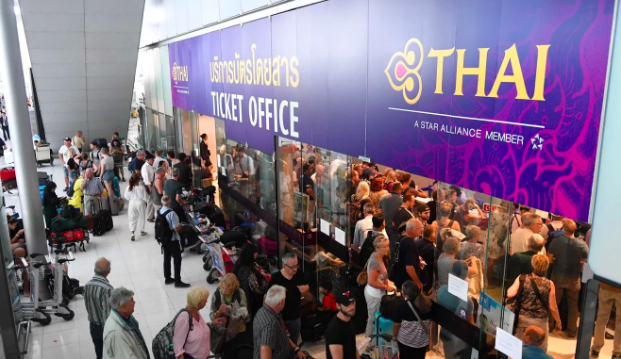 "First, the availability of multiple-entry tourist visas and the sharp drop in air ticket prices have made it convenient and practical to stay abroad for from a few weeks to up to three months each year." Now, many well-to-do Chinese middle class families can get a tourist visa for five or even 10 years that allows them to stay in a number of countries -- including the United States, Australia, Canada, New Zealand and other Asian countries -- for up to six months at a time. "In 2011, a round-trip air ticket from Shanghai to New Zealand cost 14,000 yuan (US$2,000), but now is about 4,000 (US$598)," added Cai. "In [the Thai cities of] Bangkok and Chiang Mai, there are more and more Chinese who stay there to experience the local lifestyle, which is different from theirs in China. The life there is very different from that in China," said Owen Zhu, who now lives in the Bangkok condo he bought last year. "The freedom, culture and community are diversified. The quality of air, food and services are much higher than in first-tier cities in China, but the prices are more affordable. "In Bangkok, in many international apartment complexes where foreigners live, the monthly rent for a one-bedroom [apartment] is about 2,000 (US$298) to 3,000 yuan." "Many Chinese people around me, really, come to Thailand to live for a while and go back to China, but then come back again after a few months." Both Cai and Zhu said they discovered the new phenomenon among China's middle class and decided it was a business opportunity. Last year, Zheng Feng, a single mother and freelance writer from Beijing, rented a small villa in Australia for a month for them, a friend and their children to escape Beijing's pollution and experience life overseas. "To be honest, I don't have enough money to invest in a property or a green card in Australia. But it's very affordable for me and my son to pay about 30,000 yuan (US$4,484) to live abroad for one or two months." Zheng said. Zheng's friend, Alice Yu, invested in an American EB-5 investor visa a few years ago, and plans to make one or two month-long trips abroad each year until her family is finally able to move to the United States. "Maybe it will soon become standard for a real Chinese middle-class family to have the time and money to enjoy a long stay at a countryside villa overseas," said Yu. "Regardless of whether we can get a long-term visa for the United States, I want my children grow up in a global lifestyle and with more freedom than just growing up on the mainland. So do all wealthy and middle class Chinese families, I think." Karen Gao's son started studying at an international school in Chiang Mai in June, at the cost of about 70,000 yuan (US$10,462) a year, after she quit her job as a public relations manager in Shenzhen and moved to Thailand on a tourist visa. "A few months each year for good air, good food and no censorship and internet control, but cheaper living costs compared to Beijing, it sounds like a really good deal to go," said Gao, who has now been offered a guardian visa to accompany her son, who has already been given a student visa. "In Shenzhen, I wasn't able to get him into school because I had no [local] residence permit. "It would be the best choice for us because we feel so uncertain and worried about investing and living in the mainland." Last year, Gao, like thousands of other private investors mostly middle class people living in first-tier cities, suffered significant losses when their investments in hotels and inns in Dali, Yunnan province, were demolished amid the local government's campaign to curb pollution and improve the environment around Lake Erhai. "We were robbed by the officials without proper compensation," Gao said.